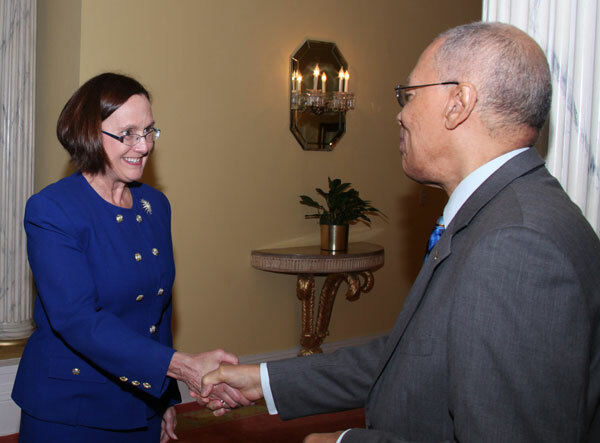 Nassau, Bahamas - Executives of The College of The Bahamas (COB) pay courtesy call on Governor-General Sir Arthur Foulkes, pictured right, shaking hands with College President, Dr. Betsy Vogel-Boze, on Tuesday, February 1, 2011, at Government House. Governor General Sir Arthur Foulkes welcomes executives of The College of The Bahamas to Government House during a courtesy call on Tuesday, February 1, 2011. 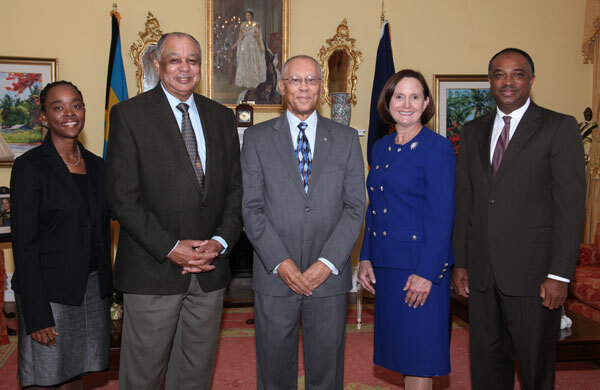 Pictured from left to right: Ms. Gabriella Fraser, associate vice president, external affairs, COB; T. Baswell Donaldson, Council chairman COB; Sir Arthur; Dr. Betsy Vogel-Boze, president COB; and Melvin Seymour, secretary to the Governor-General.